Because of the climate—which dictates what grows well—you’ll see apple orchards rather than grape vines here in the north of France. 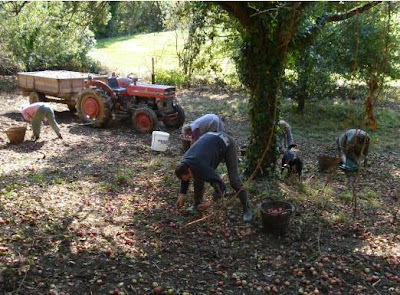 Hence Brittany is not a wine producing region but is well know for its cider. I imagine that making cider on a small scale is less complex than wine (please post a comment if you know differently). The basics are that you squash apples to get the juice, which ferments naturally, and with no added yeast, to become alcoholic cider (“hard cider”, for any American readers [for whom I also include this subliminal, political message: Vote Obama! please]). If you just want apple juice, you have to pasteurise it. 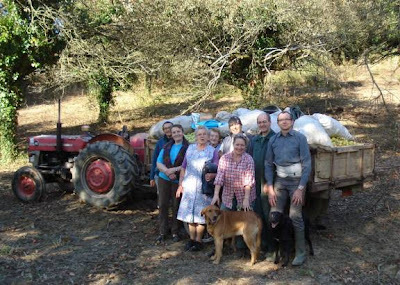 Here in the Brittany countryside, making cider on a family scale is still a common event. Paul and Christiane, our pig-farming neighbours, are no exceptions but, busy as they always are, they haven’t found the time since 2000. Cider doesn’t keep in the way wine sometimes can and perhaps it was because their 2000 bottles were tasting bitter that they decided the time, and the apples were ripe. Many hands make light work, as the saying goes, and a team of expert apple pickers was assembled: Paul and Christiane, bien sûr, Christiane’s sister, Cecile, and her husband, Bernard, and his mum and Paul’s mum, me, Gabrielle and her brother, Bruin, not forgetting Aldo the large yet amiable Labrador cross. A physical, somewhat bent-double-back-breaking yet also very enjoyable day was pleasantly punctuated by the obligatory French lunch, consisting of aperitifs such as port (which the English tend to drink after a meal as a digestive) aniseed-flavoured pastis or even whisky, served with crisps, followed by a starter, main course (curiously referred to as the plat de resistance) accompanied by cider, cheese, accompanied by red wine, then dessert and coffee. Bruin, here to stay with us for a couple of weeks, wasn’t at all prepared for all this and thought, not unreasonably, that the entrée (starter) was it and so—being a hungry boy after a hard morning’s apple picking—he got rather tucked in, so to speak. You should have seen his face when the main course arrived. It would be fair to say that we weren’t quite so dynamic in the afternoon session and I was very pleased to see the trailer full to capacity, calling an end to proceedings. The apples were left in the trailer, exposed to the elements, for a couple of weeks to mature before turning into juice. 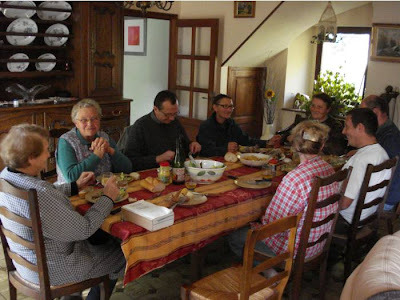 Have a look at this link to see our little lot in Aveyron doing the exact same things. For fresh unpasteurized apple juice all year round, you can freeze the juice right away. Use used plastic milk bottles (or even glass bottles), leave the top fifth unfilled, do not screw the cap all the way, and place the bottles upright in the freezer (you need a big freezer). That way the liquid can expand when it freezes and the excess air can exit the bottle. When the bottles are frozen, you can screw the cap all the way and store them on the side if it's more convenient. Note that frozen bottles are a very good way of ensuring thermal inertia in a freezer, for freezing new goods or for resisting to blackouts. Kristen has finally explained my lack of drive - Thermal inertia! I must have a couple of frozen bottles of apple juice inside me. Save a bottle of the finished product for me Stuart. these photographs, the community, the colors of the fabrics and the light-filled (cosmetic free!) faces, are almost the very definition of civilization. thank you.